Things around here have been stressful lately what with trying to get my son a school place and having no help at all from the LEA, my dog being poorly (I'll save this for another time since I cannot quite write the words) and family stuff, well it's been all stress after stress. The one thing that keeps me sane, helps me to unwind and not be so completely consumed by stress is the garden and also the allotment - the latter of which needs a lot of work but hey ho, it's still stress reducing and I get to take home fresh fruit and vegetables. When you sprinkle a packet of seeds onto compost or push a seed into the earth it starts the whole magic off. Every day checking and nurturing that seedling until you have a leafy plant that starts flowering and fruiting. There is something so addictive and so calming about the whole process, unless the slugs get them. But even the challenge of successful growing is a good occupier of the mind. If you're combating slugs then some of your angers are taken away by that. 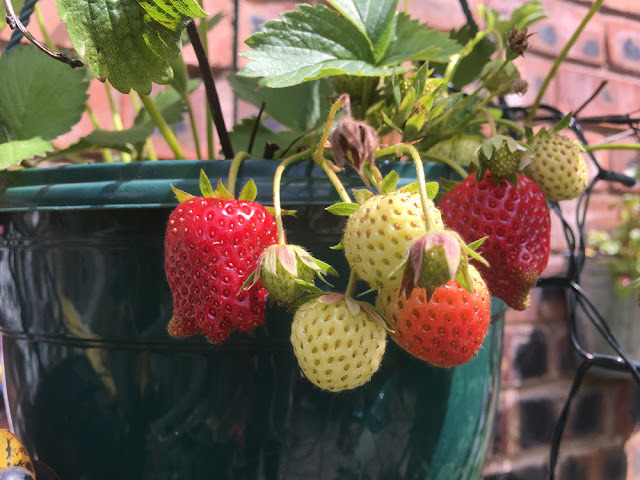 Most years I grow strawberries and having them in baskets on my patio is really satisfying as I can catch them when they are ready and eat them straight way, sharing with my son. I grow potatoes at the allotment and lots of beans, bringing home a full bounty of goodies to eat is very rewarding and improves how I feel. If you don't have a garden of your own, or a place for even a few pots at the front of the building then have a look for a local community garden. Great places for meeting like minded people and many work with lots of local charities too, so it become a wonderful place for all working together. My local gardens are open to all and you can learn new skills there, even how to be a bee keeper. Garden therapy can work on its own or add as part of a plan with experienced psychologists and psychiatrists to help when things get too tough. Stress and depression is not an easy matter and I'm glad people are becoming more away of these issues. My son suffers with anxiety, it is part of the way he is and being out in the garden helps him so much. The social aspect of community gardening is a great way for socialising in an indirect way. Weeding and potting up require no words, is calming and informal for ways of interacting with other people. When I was young my father grew amazing blooms such as dahlias and we would always have some in the house over the summer as a cut flower. 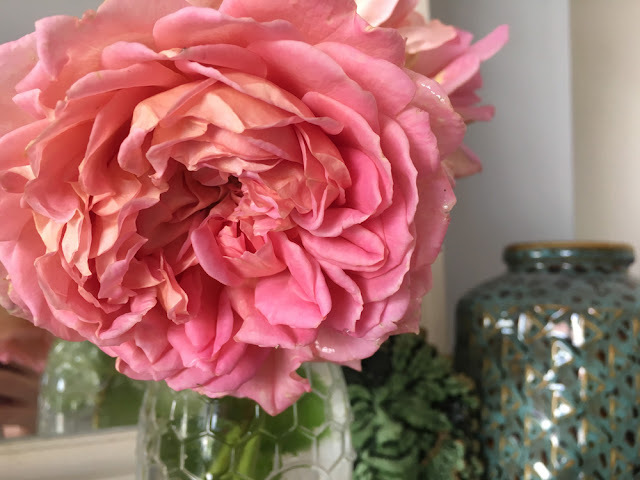 Flowers within the home do brighten the place up and being able to pick your own from the garden is easy and a quick pick-me-up. Roses in the garden provide blooms nearly all the way through the summer. Next year I would like to grow a cutting garden, you can buy packs of seeds where they have been carefully selected for being a good cut flower. The bees win too and you will be rewarded with nature aplenty.